Missouri S&T electrical engineering senior Kevin McPherson (center) was honored by Rolla Fire Chief Ron Smith (left) and S&T Police Chief Doug Roberts for saving a fellow student from drowning. 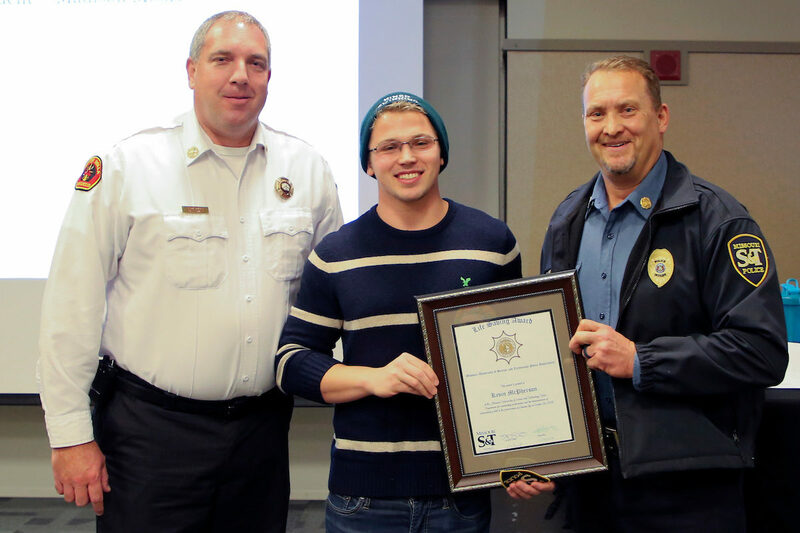 Missouri S&T Police Chief Doug Roberts and Ron Smith, chief of Rolla Fire and Rescue, surprised a Missouri S&T student Tuesday, Nov. 27, with an award for his life-saving efforts while working as a lifeguard on campus. The student, Kevin McPherson, received the recognition during Tuesday evening’s Missouri S&T Student Council meeting at the Havener Center on campus. He was unaware that he would receive the recognition, believing he had been invited to the meeting to provide an update on the swim team. On Tuesday, Oct. 30, McPherson, a senior in electrical engineering from Oakdale, Minnesota, and a member of the S&T swimming team, pulled a student from the pool at the Gale Bullman Building and performed CPR until she regained consciousness. Roberts says McPherson saved the woman’s life, and he wanted to recognize McPherson’s good deed. Following Roberts’ presentation, Smith presented McPherson with a Rolla Fire and Rescue “challenge coin” in recognition of the rescue. 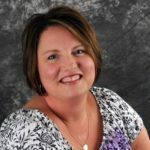 In addition to being a member of the swimming team, McPherson helps coach local swim students through the Rolla Fins Swim Club. In the 2017-18 school year, McPherson earned All-American honors as part of the Miners’ 400- and 800-yard freestyle relay teams, both of which finished among the top eight at the NCAA II Championships.